Today has been a good day! It started with my weekly appointment with my doctor. We had to have an ultrasound today since I'm measuring 4 weeks small. I'll share more on all of that tomorrow but thankfully everything with Campbell looks great! I had a good feeling about it so I really wasn't nervous about the ultrasound at all. It was nice getting to see the little one again even though he was so squished it was honestly hard to make out anything. We got to watch him practicing his breathing and swallowing and it's comforting to know that everything with the umbilical cord looked good. That cord scares me! I was hoping we would get to stare at his little face and she flipped it on 4D for us to get a look but he is so far down and so cramped that there really wasn't much to look at. I guess I'll just have to be patient and wait until Campbell arrives before I can get a good look at his sweet little face again! After our appointment Scott and I had a lunch date at Table Mesa. Yum. 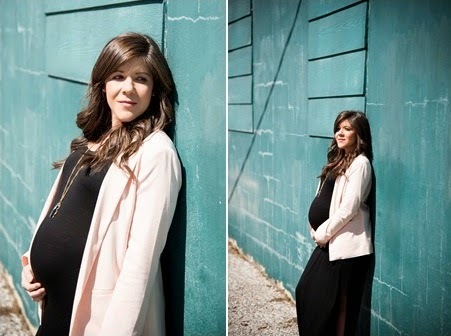 We had our camera with us so we decided to take some bump pics on the Bentonville square for tomorrow's 36 week update. They'll probably be the last bump photos Scott takes of me which is a little sad to me! I'll miss the bump. Wanna see a little sneak preview of what's to come tomorrow? It was such a beautiful day today and I have been wearing maxi dresses every day this week (well except for yesterday because it was cold) and it has been wonderful!!!! I am so glad that it is warmer outside. My tulips are starting to sprout, I've been taking the girls on walks, Scott and I have been hanging out on our back porch and this all makes me so very happy. According to the 10 day forecast on my weather.com app, it's kind of sort of officially spring time and I am loving that.